What exactly is practical life work? There is an area in the Primary classroom called “practical life” that is often the space that first draws in young children to explore. The practical life area contains tools that children might see adults using in their homes, things like sponges for scrubbing, knives for cutting, and tongs for moving small objects. The practical life area gives young children an opportunity to participate in real world work. They practice pouring from pitchers and build their fine motor skills using spoons to scoop from one bowl to another. The children help to beautify the special objects in their classroom by polishing wood and metal. 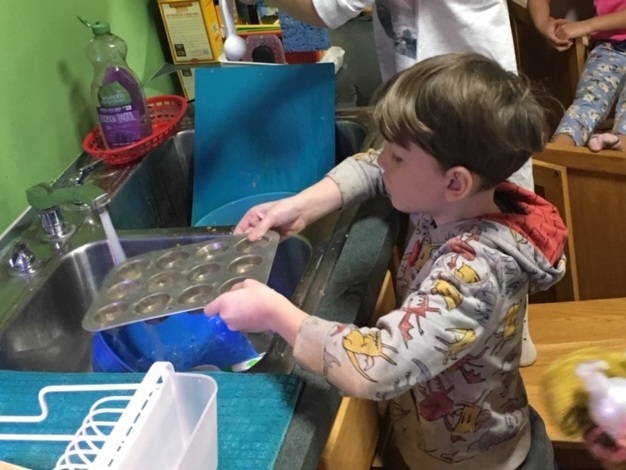 They also participate in scrubbing tables and chairs - making lots of bubbles and getting a chance to use and use their muscles. They learn to handle tools like hammers and knives safely. There is so much pride in learning to hammer nails and cut up fruit to serve at snack time! In the elementary classroom, practical life means that the children set their tables and wash dishes at the end of lunch time. They also participate in caring for all the animals in the classroom - feeding the animals and cleaning their homes. the animals provide great companionship to the children in our classrooms! Practical life gives children real world experience in taking ownership for their belongings and spaces. As we always say, the classroom belongs to the children.